Passive solar technology necessitates home designs in which the house itself serves as the collector, the storage medium, and the distribution path for heating and cooling. It also requires more user involvement in operating or cycling some of the infrastructure such as reflectors, blinds, or vent dampers. But it does not require electrically driven, mechanical equipment such as pumps, thermostats, or controllers, and often nearly no pipes or valves. A passive solar house is a "fixed" position collector and these charts show that one cannot achieve 100% of the heating load through renewable means. Solar astrophysics must be considered and various priority choices must be made. Still, a passive home will likely be the cheapest to operate. This technology harvests sunshine, but the radiation's conversion to heat takes place INSIDE of your building because your building IS the solar collector in this case. To be effective, a passive solar house must always be oriented toward the winter sun (southward in the northern hemisphere of the Earth); and it must be very well insulated and sealed. Like active systems, trying for 100% of one's heating load all year is neither easy nor cost-effective. A back-up heat source is required, and since heating loads often occur on cloudy days; too many of these in a row and your thermal storage will have been exhausted, anyway. Thermal storage in passive systems is more accurately termed "Thermal Mass," and it must be sized according to the solar gain you anticipate through your "aperture," (the amount of glazing you point toward the sun). Mass can be nearly anything, but less dense materials take up too much floorspace and your life may feel like you're more of a solar slave than an actual human who happens to live in a solar house. Water and concrete are common. Stone (in the right size/shape) is useful, and then there are phase-change chemical substances which can store the most per unit of volume. But their cost is substantially more than the other common types, and there are questions remaining as to how many phase-changes are contained in the useful life of such materials. An aperture that is overhung to favor winter radiation input and summer radiation exclusion, a glazing layer, and thermal mass struck by sunshine is all it takes. Plus, insulation between the outside of the mass and the ambient air or soil. A vented Trombe wall is an "indirect" passive solar thermal system which delivers heat to the living space by a managed ratio of heat by convective and radiational means. The outside of the wall itself IS the solar collector. Schematic of a passive (indirect) solar collection system. This means that the sun does not enter the living space, but must store its heat in thermal mass. Convective air circulation drives the system in the daylight hours. Radiant heat migrates through the concrete Trombe Wall during night time hours, based on engineered thickness. It is also possible to close convection vents and rely on delayed, indirect heat through radiation long after sundown. The working "fluid" in passive collection is usually air, a notoriously poor conductor of heat. It's over three thousand times less dense than water, but it will not need to be contained, ducted, or blown around by fans (usually). Convection will move it around for you. This "weakness" of air can be largely overcome if the mass you use is placed just inside of the glazing, and your room space is behind that. In this case incident radiation can convert to heat directly at the outward facing surface of the mass, and conduction will do the heat transfer job. While that may encourage you; to the extent you shove mass against your glazing, you are losing the view—just one of many trade-offs from living in passive construction. Using clever design, there are ways to put enough mass adjacent to glazing and yet still "see over it" from a sitting position in the same room. Mass can be hidden semi-decoratively from the living space and still do its job; both converting and storing heat, and distributing it to the inside air as that inside air cools off. But one must always remember the physics of Entropy—your air must drop substantially in temperature to get denser mass to yield up it's btus. This is why if you are a "passive solar patriot" you will face greater extremes of temperature of the inside air than a conventionally heated or active solar house would experience. The smug satisfaction of lower construction and operating cost may not serve so well when you need to bulk up on clothing in the winter, and strip some of it off in summer—yet many are happy with the chance to live like that. If you'll ever need to sell a passive house, you must realize before starting it that your prospects will be fewer than for the solar (active) home that operates conventionally. Vertical culverts on steel bases being prepared for use at Village Homes in Davis, CA, 1977. Culverts were painted flat black, placed inside behind glazing, and filled with water and a rust inhibitor. Their volume is an engineered design element, not a guess. Inside the New Mexico residence of Steve Baer in the early 1970s. Baer named his odd externally shaped buildings "Zomes," and he is widely considered as the grandfather of the water wall passive solar system. But skeptics were many, and drum aesthetics appealed to few. Baer eventually concluded that the ratio of his aperture compared to his water volume was too low (he needed more glazing and less water). Interior air had a hard battle getting so much water to surrender its heat content, and such heat was at too low a temperature when it finally did. This is an example of why the math of thermal mass and glazing size is critical. 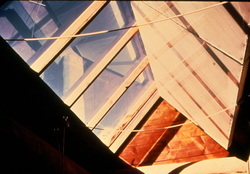 The Zome had a number of clever features such as reflective closure devices providing a boost in solar gains in daytime, and served as an insulated closure at night. While many energy conserving enthusiasts might relish living with a house where lowering and raising reflectors based on sunshine, bad weather, or night time as being "in tune" with natural systems— the mass market for housing and savings through the use of renewables does not likely agree. Baer later pioneered passive, mechanical daylight shutters and brought the same innovation to dual-axis tracking racks for photovoltaics. These non-motorized devices enable pole-mounted PV to track the sun both seasonally and daily. The yellow diagram below doesn't quite tell the story. The TAP is a home-built or commercial unit that's "bolted up" onto an existing wall on the southern exposure of your house. It has manual closures on the inside air ports, but can do a nice job when the sun is out. You don't sacrifice wall insulation but you do achieve benefits on a wall surface that didn't previously contain a window. The yellow TAP diagram (thermosiphoning air panel) looks a lot like a vented Trombe wall, but is usually smaller and can be home made. It passes interior air across conductive metallic portions of the panel and drives warmer air out of the upper convective vent. Wall mounted units make sense with a winter sun that's lower in the sky. Proper overhangs, or mechanical covers could keep this device from adding unwanted interior heat in summer.